One of the Categories in Akademia is the Common Errors Category. There, there are several posts dedicated to explaining words in English that users find confusing. This particular post, Affect vs Effect: Meaning, Usage and Examples, falls under the category of commonly confused words. Most of the words in English have similar sounds, spellings but different meanings, see Homonyms. Homophones are words with same sounds but different spellings and meanings while others have same spellings, different meanings and sounds and we refer to them as Homographs. Without a proper understanding of Parts of Speech in English, there will always be a confusion when dealing with these similar or related words. 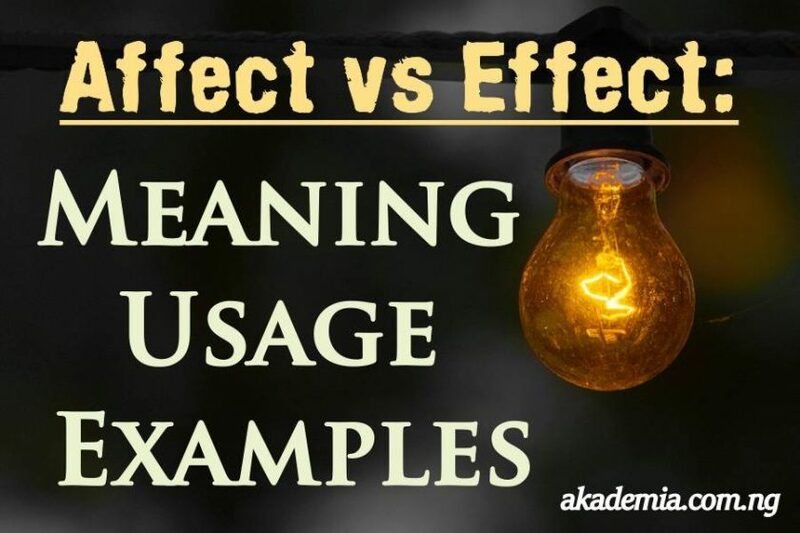 In this post, we will take a look at ‘Affect’ and ‘Effect’ as a pair in the long list of closely related words which have the tendency to confuse their users. We will start by defining each one, then we will explain how we use each word with illustrative examples for proper comprehension. Shall we begin? This is both a verb and a noun. As a Verb, it means to produce a change in or influence something; it also means to have an effect upon, influence, bear on, bear upon, impact, touch, touch on, alter, change, modify, etc. The dog’s death will affect his owners. You must not allow peer pressure affect your studies. Lack of money usually affects people’s mood. The medicine affects his heart rate. The cold weather affected his voice. The drought affected the crops’ yield. As a noun, it means the conscious subjective aspect of feeling or emotion; it also means a feeling. It means: consequence, event, issue, outcome, result, upshot, etc. He came to pick his personal effects after he was sacked. I have nothing in his room except my personal effect. Effect also means ‘the quality or state of being operative’ that is, what is operational. E. g.
The law goes into effect next week. The anti-Open Grazing Bill is in effect in many states. The scientists effect a shock wave. There is a need to effect a change in the cabinet. There must be a stakeholders’ meeting if government must effect the new tax law. The election has affected our entire society, for it has effected major changes in the government. The bad weather has a bad effect [not affect] on him. The Committee agreed to what was in effect. In effect, this means that the program is shut down. He issued a statement to the effect that he would resign. She objected and replied to that effect the next day. The answer was “No” – or words to that effect.